﻿ Create a Holiday Flash Sale Email to End the Year Strong » Red Mango Marketing! You had a strong year, but what if it was just a little bit better? As most holiday marketing comes to an end, your customers are still buying. When you’re taking a few days off, so are your customers, which means they have the time to browse your products one more time before the year is up. Even if you still want to take some time with your family, you can design and schedule your flash sale ahead of time. Then, design an email campaign to reward your best customers, highlight the limited-time offer, and drive people to act before it’s too late. A year-end flash sale can target those customers still shopping through the holidays, surprising them with a good deal when they have time to act on it. Find out how to get started and design a flash sale email that can boost your year-end revenue. Your best customers have supported your business the entire year, so why not reward them? Saving your flash sale for the customers who are most likely to open and click on your email not only rewards them, but the smaller, targeted list means you can afford to offer a bigger discount, or position the sale as exclusive. Keeping customers happy helps you with your customer retention, and an exclusive flash sale shows customers how much you appreciate their business. Designing your flash sale email as a thank you provides context for an end of the year surprise email that offers a discount, even when customers think the discount holiday season is over. Your headline and body text should make it clear the flash sale is available only for a limited time. Then, stick to that deadline. You may want to squeeze out a little more revenue from your sale, but extending the deadline at the last minute makes your customers feel cheated. Instead, use your email design to make clear the sale ends soon to inspire customers to act fast. If your flash sale lasts a single day, highlight the deadline in the subject line. With a headline like, “Flash Sale – Today Only,” your customers understand the time to benefit from the sale is now or never. Then, continue highlighting that deadline in your headline, in your body text, and all the to your call-to-action. After the right customer opens your flash sale email and your body text compels them to act, you need to tell them what to do next. Use a direct and clear call-to-action that pushes people to click. Check the links in your email before sending to make sure that when a customer clicks the button, they go to the right place. Keep your design simple, and use contrasting colors to make the button text easy to read. With more than one call-to-action, or too many distracting design elements, customers can become discouraged and simply close out the email. A simple design with a button color that stands out is a call-to-action just begging to be clicked. Instead of logging in to send your flash sale email when you’re taking time off for the holidays, you can schedule an email automation ahead of time. As long as your eCommerce tool allows you to schedule a sale, you can run a successful campaign without tending the wheel. Even if you need to manually activate the sale, at least your email marketing is all set. Plan to send at least two emails in the series, one announcing the sale, and another near the end of the deadline, reminding customers that time is running out. You can also add a third email, scheduled to send a few days after the sale, offering related products to those customers that opened the email, but didn’t click. Every small business could use a little more revenue, especially at the end of a year. A flash sale email can reward your best customers, highlight a limited-time offer, and drive people to act before it’s too late. Learn how to get started so you can pair the right design with the right offer, and finish your year strong. 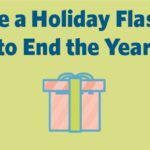 The post Create a Holiday Flash Sale Email to End the Year Strong appeared first on Constant Contact Blogs. This entry was posted on Friday, December 21st, 2018 at 9:49 am	and is filed under Email Marketing, News & Updates. You can follow any responses to this entry through the RSS 2.0 feed. Both comments and pings are currently closed.